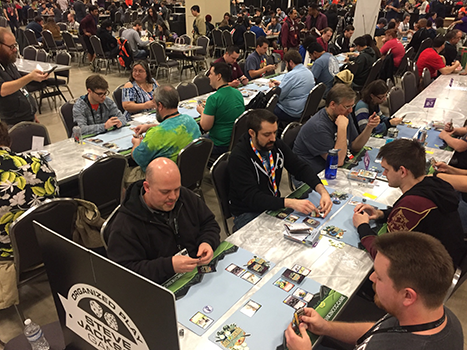 Daily Illuminator: PAX South 2018 Convention Report! January 16, 2018: PAX South 2018 Convention Report! Incredible. It's the one word that keeps coming to mind when thinking about this past weekend at PAX South in San Antonio. 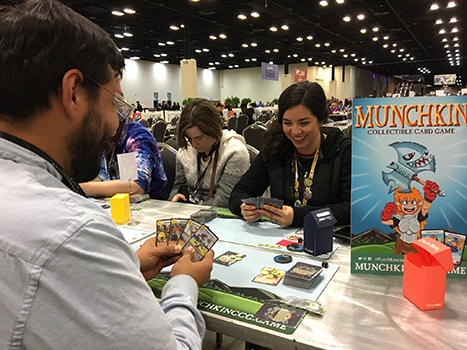 This was our first convention with actual, real-life Munchkin Collectible Card Game product, and it was simply . . . well, incredible. The booth was hopping from morning until night with people trying to get a seat for a demo, and everyone was having a blast with the game! 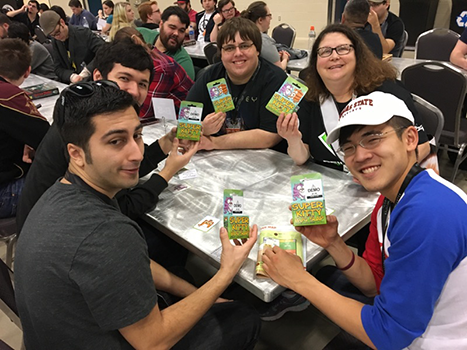 Not only that, but some lucky players walked away with some early promos from our organized-play kits, which will be available to local game stores when the game releases! And did I mention our how-to-play events? Not only did all four events sell out, but we had overflow players who we taught between events, and even passersby trying to get in on the action. Ariel and I tried our best to keep up, and we appreciate everyone who attended the scheduled events; it was a blast teaching you all! 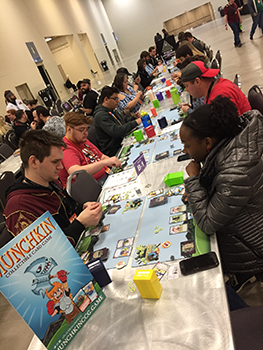 But all of this was the preamble to the main event: the very first organized Munchkin CCG tournament! 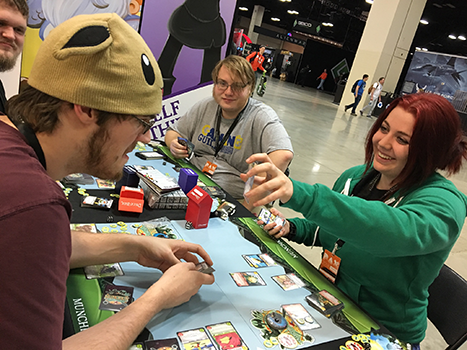 Attendees picked their deck, and played four rounds of bluffing, squishing, spilling action! All six classes were represented, and in the end, it came down to Dwarf Cleric versus Elf Thief. I won't spoil the ending; we recorded it at the event and will be posting it online soon with commentary. The winners and top eight performers took home some of the first booster packs off the production line, plus they kept their starter decks! To say we're excited that fans are finally able to take cards home with them is an understatement. If you missed out on the event and want to check the game out, make sure to look for prerelease events in your area coming at the end of the month. And remember, preorder at your local game store or on Warehouse 23! It's coming out in February, but based on the response, you may want to preorder to make sure you get the starter sets and packs you want. 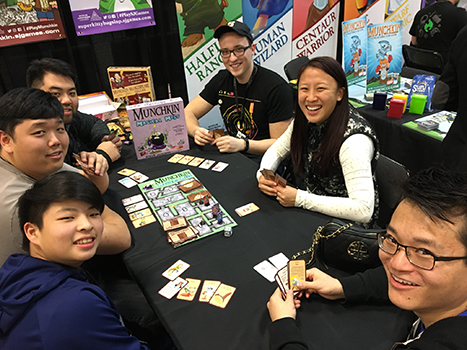 PAX South wasn't just Munchkin CCG, though; we also showed off Munchkin Magical Mess, the upcoming sequel to Moop's Monster Mashup. Full of monstrous mashups and jokes that were just too groan-inducing for anyone but Moop, Magical Mess will be out at the end of the month (you can also preorder now). Our tournament ended in a very munchkin-y way, which is, of course, the best way. 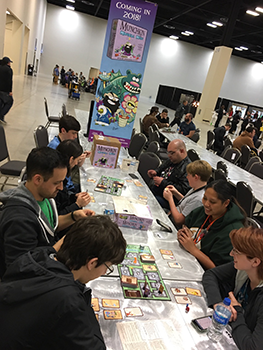 Speaking of tournaments, thanks to all of the attendees of our other events, like the Super Kitty Bug Slap, Ogre Sixth Edition, Zombie Dice, and Batman: The Animated Series Dice Game events, as well as PAX for running the massive Munchcathlon. This was the biggest PAX South yet, and we wouldn't be able to do it without the assistance of the awesome Enforcer staff, and the enthusiastic gamers who come to the events, so thank you all! 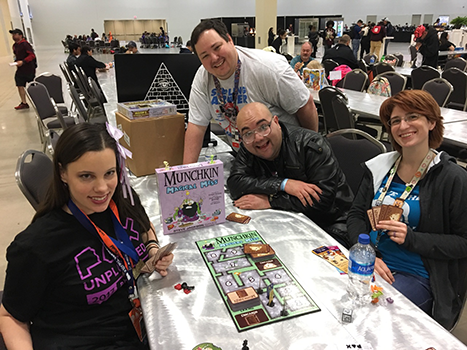 We've got a lot of shows coming up, including our Munchkin CCG prereleases (where I'll be in the Baltimore/Washington, D.C. area), so keep an eye out for SJ Games around the U.S., and come play some games with us!